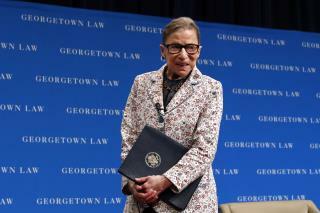 (Newser) – Ruth Bader Ginsburg is "notorious" for, among other things, her killer workouts, which is maybe why the fit 85-year-old justice brushed off a tumble she took Wednesday evening at her office. However, the Supreme Court issued a statement Thursday noting that after she went home, Ginsburg had "discomfort overnight," and a visit to George Washington University Hospital early Thursday revealed she broke three ribs on her left side, USA Today reports. Most of the commentators on here, obviously Republicans, are asses. Justice Ginsburg has a sharp mind, and that's what we need in a Supreme Court Justice. I wish her the very best of health while she's mending. You go lady! I really think Supreme Court justices should have a term limit due to age. Like it or not elderly people will have challenges with logical thinking and physical fitness.